The other day I read a comment on social media from a woman that was unhappy with her instant pot. Her negatvitiy hit a cord with IP fanatics and there was a stream of debate in the comments below her post. I enjoyed reading the comments and afterwards I felt like giving my IP a little kiss. I just love it! If you are unsure about his whole IP fad, all you need to do is make this Instant Pot Applesauce (which cooks the best homemade applesauce in just 8 minutes) or these Instant Pot Chicken Taco Bowls. What is not to love about a meal where you can throw raw ingredients in a pot and have it ready to eat in less than 20 minutes? And did I mention there is just one pot to wash when you’re finished? I’m convinced that anyone who doesn’t love their IP has just not found the right recipes to try! 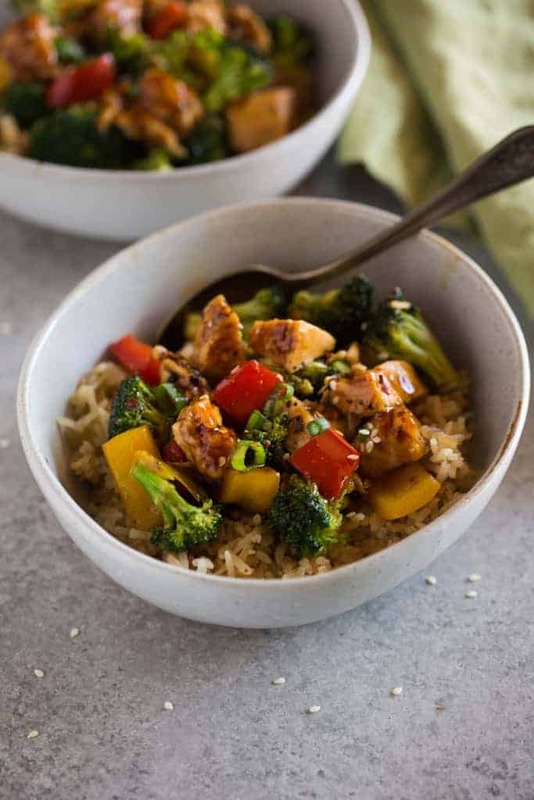 I hope you love this instant pot chicken teriyaki bowls recipe as much as my family does! DISCLAIMER: I developed and tested this recipe for use in the 6-QUART INSTANT POT. If you’re using a larger IP you may need to add more liquid so that you don’t get a burn notice.. Not all instant pot recipes work perfectly for all types of instant pots. See this article for more information on adapting recipes for your instant pot. Yes, but some adaptions will be needed. 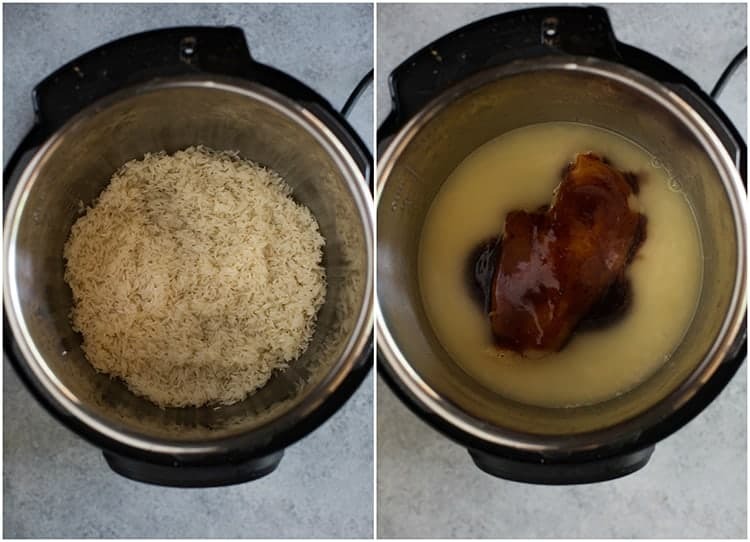 Add 1/2 – 1 cup more chicken broth, and I would also suggest using chicken thighs, or cooking the chicken separately, so that it doesn’t get overcooked/dry. 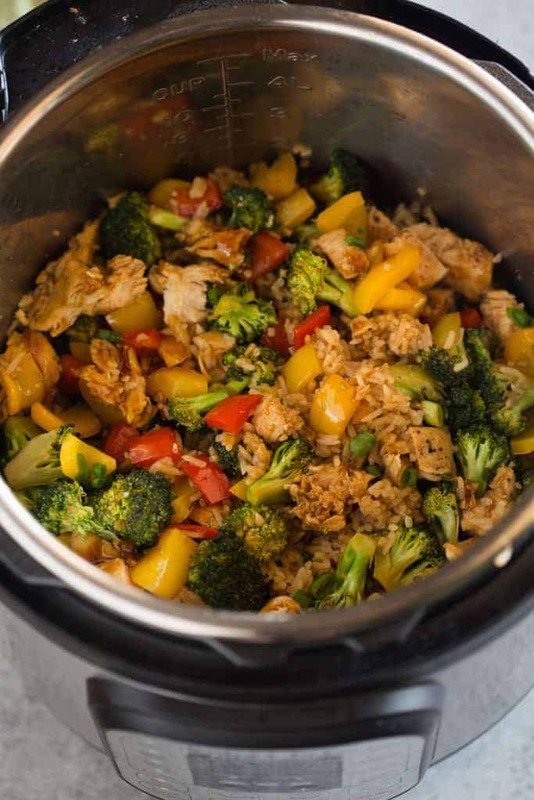 Brown rice takes longer to cook in the IP–about 22-24 minutes (22 for low elevations, 24 for higher). Then follow the same pressure release instructions. Substitute the chicken for flank steak, to make a beef teriyaki bowl. Sear the meat in a little bit of oil, on the saute setting, and then add the teriyaki sauce, rice and water. Cook time is the same. 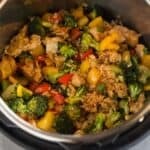 You can add vegetables to the instant pot to cook (instead of sauteing them separately), but they will be really soft. Add other vegetables you like, including edamame, snap peas, green beans, carrots, asparagus, bean sprouts, or others. Yes, you can use frozen chicken, instead of fresh, if you’d like. I personally don’t love the way the instant pot cooks frozen chicken–it always seems “chewy” to me– but most people seem to like it just fine. For frozen chicken, do everything the same but cook for 10 minutes, with a 5 minute natural release. DISCLAIMER: I developed and tested this recipe in my 6-QUART INSTANT POT DUO. If you’re using a larger IP or a newer brand you may need to add more liquid so that you don’t get a burn notice. (The new IP are much more sensitive). Not all instant pot recipes work perfectly for all types of instant pots. See this article for more information on adapting recipes for your instant pot. Rinse rice with water until water runs clear. Add rice and 1 1/2 cups water (or chicken broth) to the bottom of the instant pot. Spread into a single layer, making sure the rice is covered with water. Season chicken breast on all sides with salt and pepper, garlic powder and ground ginger. Add chicken to instant pot, nestling it on top of the rice. Pour 1/4 cup of teriyaki sauce over chicken breast. Secure the lid, and set the valve to sealing. Cook on manual or pressure cook, high pressure, for 4 minutes (IF using a THICK chicken breast, cook for 6-8 minutes high pressure). Once the Instant Pot timer beeps, allow the pressure cooker to release naturally for 10 minutes., then quick release the remaining pressure. While the mixture cooks, heat oil in a large skillet. Once hot, add chopped vegetables and sauté until tender. Add a few spoonfuls of teriyaki sauce to the vegetables and toss to coat. Open instant pot lid and remove chicken to a cutting board to rest for 5 minutes. Fluff rice with a fork. Chop chicken, against the grain and add it and the vegetables back to the pot with the rice. Spoon servings into bowls and top with desired amount of teriyaki sauce. Garnish with sesame seeds, green onions, and sriracha hot sauce or crushed red pepper flakes, if desired. *Suggestions for adapting this recipe can be found above in the post. This is one of my go-to recipes. My entire family loves it and it fits perfectly within my husband’s weight-loss diet. It’s even easier if you prep your veggies in advance, just toss and go. I usually double the amount if vegetables. Mostly because we like to fill up on them, and they are SOOO good! My only issue is, even after adding more chicken broth, the very bottom of my rice still browns. Anyone have a solution to this? What’s your cooking time recommendation if using a family pack of breasts, about 3 lbs?